Work at Lighthouse Field includes multiple projects with the overarching goal of increasing biodiversity and enhancing monarch butterfly habitat at Lighthouse Field. The coastal scrub restoration project began in 2013 with California State Parks,Gateway School and the Bay View Brownie Troop. The restoration work has improved pollinator and song bird habitat in Lighthouse Field and paved the way for subsequent work. The Lighthouse Field Habitat Enhancement Project is focused on improving habitat for monarch butterflies. 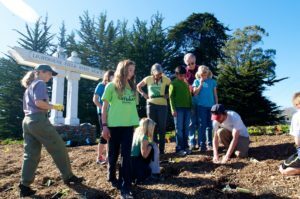 This work is a collaborative effort with California State Parks, US Fish and Wildlife Local Coastal Program and the Xerces Society. The Lighthouse Field Overwintering Site is the 7th largest monarch overwintering site West of the Rockies. 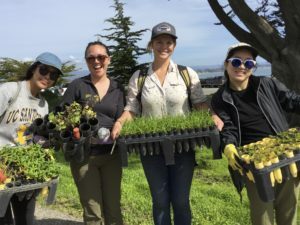 Groundswell worked with partners to create the Monarch Butterfly Site Management Plan for Lighthouse Field State Beach (Appendices: I, II, III, IV). 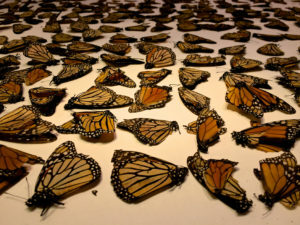 With support from the USFWS and National Fish and Wildlife Foundation we are working with project partners to implement recommendations contained in the Plan including strategic tree planting, determination and mitigation of sources of over wintering mortality and planting of monarch friendly plant species. Stay tuned, upcoming habitat improvement projects at Lighthouse Field State Park with new partners are in the works.